Server Security is something an exception. One day or another, your server will be attacked and the integrity of your data will be at risk, that does not mean you will lose the current and existing customers in the process. cPanel provides easy access to your search and accessibility, user-friendly interface for managing your website. However, it is subject to various security issues, such as any server application or environment. As a responsible webmaster or server admin, you’re caught up to identify these issues and take steps to hack some loopholes to access your server or website. A cPanel server can be secured by many means. For an easy setup and understanding I have categorized things in below manner. We can start with updating cPanel to latest version. 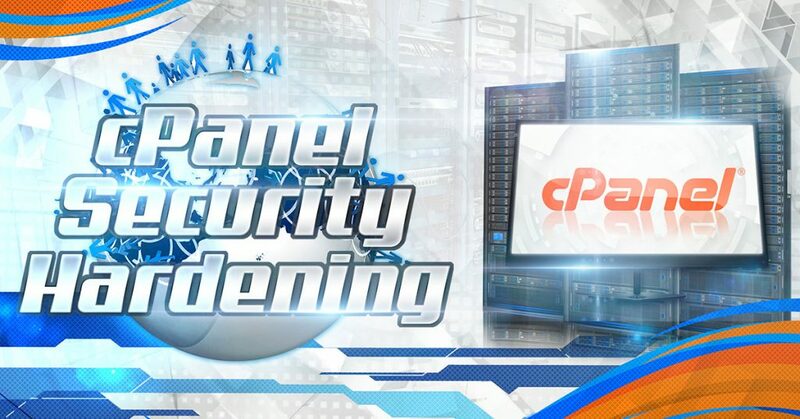 For every outdated application there will be a chance of greater vulnerability, for overcoming this issue we need to make sure that you have the latest version of cPanel running. You can simply update cPanel by running below command on the command line. The MySQL database starts up by default permitting the usage of symlinks. When a table that is using symlinks is dropped, both the symlink and the file to which the symlink points are dropped. An unauthorized user can create symlinks within a table that point to key configuration files and then drop the table. Edit /etc/my.cnf file and use –skip-symbolic-links option to disable symlinks. 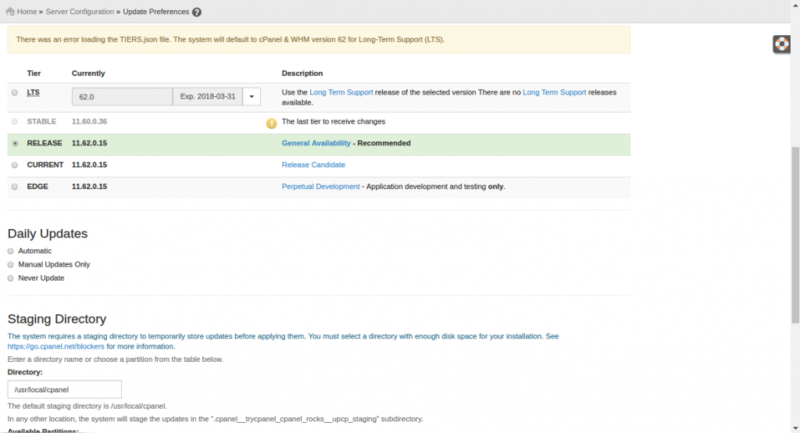 After save changes restart mysql service with below command. There are default anonymous user accounts which are created when MySQL is initially installed. These user accounts have no password by default. A strong password must be set or these accounts removed. An unauthorized user who discovers that a MySQL server is running can directly log in to the server without entering a password. The administrator account in MySQL is called root. This must be renamed to something different. Malicious user can try to compromise the system using root account. The effort involved in trying to brute force a MySQL password is reduced because the attacker already knows the username. Rename the root account to something else using the following query. Enabling logging will help administrators to monitor critical events in a MySQL server. Malicious activities will not be detected. Early warning towards attempts at malicious access will go undetected. Mysql has different types of logs. You can enabled it by adding lines in /etc/my.cnf file. There is a default database that comes preinstalled with MySQL. This database should be removed if not required. An unauthorized user can access sensitive information stored in this database. Mysql runs on default 3306 port the configuration should be change to run mysql on different port. The port will be detected as open by a port scanner by an Hacker. By this information Hacker can steal more information about mysql server. You can change port from mysql configuration file /etc/my.cnf. You can set different not default port, for example 5532. Safe Mode does a user check on files that are opened by a process. By default, the users of the file and the process need to match. Setting expose_php = Off just prevents the webserver from sending back the X-Powered-By header. The configuration directive enable_dl instructs PHP whether or not to enable dynamic loading of PHP modules with dl(). If you enable dynamic module loading, it’s possible to bypass the safe_mode restrictions. Dynamic loading is enabled by default. It helps to escaping special characters with a ‘\’ to allow a string to be entered into a database. This is considered ‘magic’ because PHP can do this automatically for you if you have magic_quotes_gpc turned on. NOTE: This feature has been DEPRECATED as of PHP 5.3.0 and REMOVED as of PHP 5.4.0. This option will helps to not display error on the webpage,so that the others cant find any vulnerabilities. According to several Security Websites administrators are strongly encouraged to disable some dangerous php-functions which can be used to exploit several php-installations and software. To protect yourself we encourage you to disable whenever possible the following functions! Order deny, allow – This is the order in which the “Deny” and “Allow” directives will be processed. Here it will “deny” first and “allow” next. Mod Security works as a firewall for our web applications and allows us to monitor traffic on a real time basis. It also helps us to protect our websites or web server from brute force attacks. Installing mod_security is can be done within a few minutes with few changes to existing infrastructure. You can enable it from Easy Apache configuration. Also malware.expert is providing advanced Mod_Security rules for Webhosting, which are based on intelligence gathered from real-world investigations, penetration tests and research data in the REAL LIFE environment of over 10 000 domains. These rules are developed over ten years with the help of real traffic to websites. When someone tries to attack the first thing they will be trying to attack on the default ssh port which is 22 .So we have to change it a custom one . open the port that you are setting up for SSH in your firewall. SSH access without password will be avaialble which is a securtity threat . It is always desired to restrict direct root access .You can ssh to server with custom user and gain root access with sudo . WHM > Tweak Settings > Always redirect users to the ssl/tls ports when visiting /cpanel, /webmail. /etc/sysctl.conf file is used to configure kernel parameters at runtime. Linux reads and applies settings from /etc/sysctl.conf at boot time. The spoofing protection prevents your network from being the source of spoofed. These command disable ping on the server. instead of bind you can give your message so as to hide the DNS version . Allowing anonymous FTP logins in generally considered to weaken the security of the server. Setting this option to “No” is recommended. Allowing anonymous FTP uploads in generally considered to weaken the security of the server. Setting this option to “No” is recommended. Maximum number of FTP connections to accept. You can also change this option by going WHM >> Security Center >> cPHulk Brute Force Protection & change from OFF to On. Fork Bomb Protection denies users who have terminal access (SSH/Telnet) the ability to use all of the resources on the server. Login to WHM and click on “Shell Fork Bomb Protection” under “Security Center”. Click on “enable protection” to enable Shell Fork Bomb Protection. Hardening tmp plays a big role in safeguarding your server from external attacks. All applications use the /tmp directory to temporarily store data. If /tmp are not secure, there is a chance to attack the server using Trojans. Temp hardening restricts all activities in / tmp. This prevents the attacker from enforcing the code in the /tmp folder. Rkhunter (Rootkit Hunter) is an open source Unix/Linux based scanner tool for Linux systems released underGPL that scans backdoors, rootkits and local exploits on your systems. It scans hidden files, wrong permissions set on binaries, suspicious strings in kernel etc. b. Run the following commands as a root user to install it. d. Add the following lines of code to it and replace “YourServerNameHere” with your “Server Name” and “your@email.com” with your “Email Id“. e. Set execute permission on the file. f. To scan the entire file system, run the Rkhunter as a root user. Compiler Access is used to gain access C or C++ compiler on the server.It is recommended to disable this compiler as Disabling these compilers will result in a more secure server as most of the attacks require a working C or C++ compiler on the server. 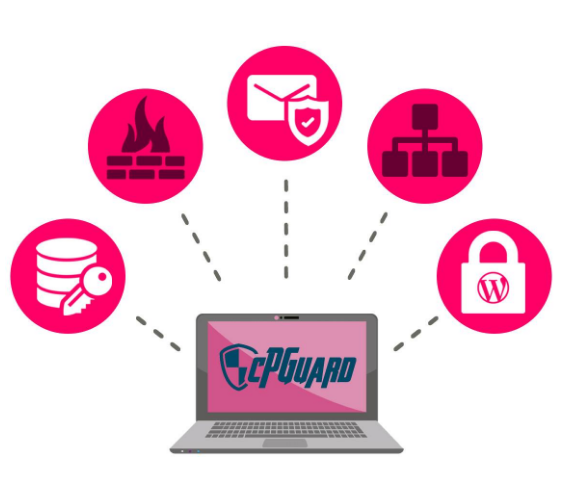 If you are lazy in doing a setup for all the above hardening, you can install cPguard, which is all in one security plugin with artificial intelligence. cPguard security plugin offers fast, light and intuitive protection against viruses and attacks giving you the best protection that’s easy to use and won’t affect server performance. Plugin contains ultimate security solution for your Linux servers and has more advanced features than any other plugin that is available on the market now, some of the features are. AND MANY MORE… You can find more information and features about the plugin from here. In this Modern era, server without proper security will always pave the way for hackers to get into it. Once a server is hacked we are unable to find what all harmful contents are uploaded to the server, if it happens the only solution left is to migrate all the server contents to a new server and it anyway consumes some time and treasures. The smartest thing you can do is implement proper security measures for cPanel as soon as your hosting account is set up. For more server security tips and tricks, click on subscribe.